TK, congratulations on finally publishing your third novel, The Dark Eve: The Golden Catacombs. Thank you, it’s a real accomplishment for me. I wasn’t quite sure how many books I had in me until this point. I have really started taking myself seriously. WHAT!! But T.K. you have three almost four books out and you are just now taking yourself seriously? Well you know what. I never expected to be an author. It kind of crept up on me and bit me in the rear-end. It’s a very vulnerable thing to change the way you think of yourself. I found myself feeling a little silly at first. I realized that I have a talent for pounding out words. You think, okay maybe people liked the first book and it was just a fluke. You write the second and cringe waiting for everyone to say, yeah try something else. BUT—they didn’t. I go back and read what I have written and am shocked sometimes that it came out of me!!! ME!!!! Launch day is always a day to celebrate. What’s the first thing you do? Take a nap and play some Age of Empires or Hero’s Might and Magic. It’s time to turn off the brain. The process is so intense that I hit a point where the project gets kicked out the door and it must go away. Time to fly and be free. 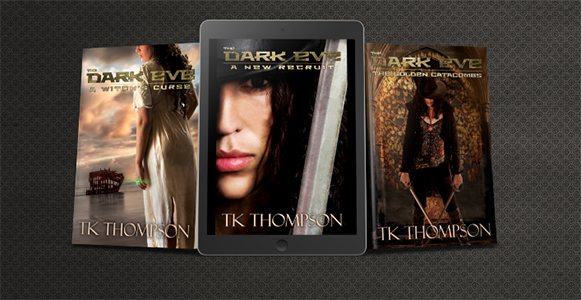 It’s been just over a year since you published The Dark Eve: A Witch’s Curse, your 2nd full-length novel. Don’t you think that’s too long a gap? Call yourself an indie author! Yes, life really happened this last year. You always have a projected date, but so many other factors go into publishing and getting a book ready. My husband, Dustin had a total shoulder replacement and it seemed to put us back a bit. I am so excited for this novel though because it is so different from the two previous books. In the first book, A New Recruit, it is all about the intense mystery of Acantha and her crew in an amazing fantasy world. The second book is more drama based, but so fulfilling because you get a ton of pay back and answers from the first book. The plot only deepens though. Now, in The Golden Catacombs I dive deeper into Acantha’s life, but we are not totally stuck in the past. The story moves on from the end of book two. We venture into Viking waters—it’s epic. I believe and so do others that have read it, that it surpasses the other two books in the series. I have an advance reader group right now that goes through the book before it’s published. I get great feedback and it’s so fulfilling to talk with them about the story elements. If anyone is interested in joining visit, http://smarturl.it/TKThompsonreviewteam. Was writing your third novel a different experience to writing your other two? This book gave me so much more anxiety! It has a lot more romantic elements in it. Don’t worry we still have the pirate action and suspense. But we get to go back and see one of Acantha’s greatest loves and biggest mistakes. We also get an awesome character that is revealed in a small novella I wrote called, Beldagar: A Dark Eve Story. Click link to get it for free: http://smarturl.it/Beldagardownload It is a great coming of age story! Is there anything you learned from writing your first book that you’ve changed about your style and approach in writing the other two? I am a lot more organized. The first book was a four-year process of getting my ideas together and figuring my writing process out. Now I generally have a small outline of events that must happen in the book. How I get to those points is a mystery even to myself sometimes. There was a particular scene in this book that was lagging… (spoiler alert) I thought about it for weeks and came up with a strange creature that haunts the ship killing the crew. It ended up being one of the most suspenseful parts of the book. Don’t read it in the dark! Will your readers have to wait another two years before the next one? NO, I am actually on my second run through of book four…no name yet. The title is evading me. This book is proving to be more challenging because a lot of the characters are going through transitions (not in a gender way). We also see a few characters coming back…it will be a great surprise. I have also written another novella that I am planning on releasing in October. (I’ll cross all my fingers and toes.) This time we get to go on a nightmarish adventure with one of our favorite three main crew members, Vaster. But if it does come a little later than expected, don’t hurt me! Where can readers buy the third book, The Golden Catacombs?